Degree in Medicine (Ptychio Iatrikis) – Medical School, National University of Athens (1977). Training in internal medicine – Internal Medicine Department, SOTIRIA General Hospital for Pulmonary Diseases of Athens (1982-1983). Specialty in cardiology – Cardiology Department, Medical School, National University of Athens (1987). Training in interventional cardiology – Cardiology Department, Medical School, National University of Athens (1987-1988). MD thesis, National University of Athens (1993). 2011 – 2019 Director – Cardiology Department, Mitera Hospital, Hygeia Group, Athens. 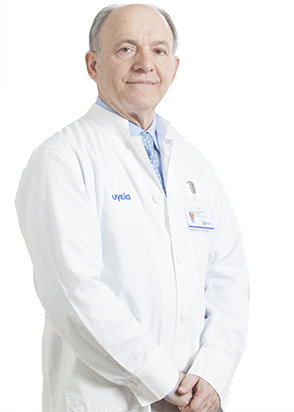 Interventional cardiologist, Member of the Scientific Staff of Hygeia Hospital, Athens. 1988 – 2000 Senior cardiologist; chief and then director, Coronary Intensive Care Unit; staff member of the interventional cardiologists of the catheterization laboratory; co-head of the catheterization laboratory; in charge and coordinator of educational programs; research physician, full member of the research programs of the Cardiology Department – Cardiology Department, Medical School, National University of Athens, Hippokration Hospital. 1987 – 1988 Specialized training in interventional cardiology and research physician – Cardiology Department, Medical School, National University of Athens, Hippokration Hospital, Athens. 1984 – 1987 Trainee in cardiology, specialty training in cardiology – Cardiology Department, Medical School, National University of Athens, Hippokration Hospital, Athens. 1982 – 1983 Trainee physician, specialty training in internal medicine – Internal Medicine Department, SOTIRIA General Hospital for Pulmonary Diseases of Athens. Clinical education of medical school students, members of nursing staff, and trainee cardiologists at Cardiology Department, Medical School, National University of Athens, Hippokration Hospital, Athens (1987-2000). In charge and coordinator of educational programs of the Cardiology Department, Medical School, National University of Athens, Hippokration Hospital, Athens (1993-2000). More than 175 presentations and lectures both in Greek and international scientific conferences, seminars and training activities. Performance of the retrograde mitral valvuloplasty technique at the Institut Cardiovasculaire Paris Sud, Massy, France, for live presentation in the Complex Coronary Angioplasty Course and International Course of Peripheral Vascular Intervention, today PCR, Paris, France; 1999, May 18-21. Coronary artery disease and acute coronary syndromes. Elastic properties of aorta and pathophysiology of the cardiovascular system (Eur Heart J 1990;11:990-996, Am J Med 1992;93:505-12, Cardiovasc Res 1993;27:951-56, Acta Cardiologica 1993;98:221-3, Chest 1994;105:1017-23, Circulation 1995;91:2669-2678, Circulation 1995;92:2210-2219, Circulation 1997;95:31-38).